This is a comprehensive course covering FrameMaker from basic tagging and style format creation to advanced book building features. If you already have a template we can cover using FrameMaker and take out the customizing features for a three day course. If you are already using FrameMaker 8 and wish to migrate to FrameMaker 9 this is the course for you. If there is time left over we can address specific FrameMaker questions from your group using your documents. 1) In-depth User’s Guide for your new template that can be used for years to come as you train new staff. Prepare your Word documents for a successful import into your FrameMaker template. How to import Word into Frame (what works best). Cleanup your Word document in Frame. Getting familiar with the FrameMaker interface. Applying predefined character and paragraph formats from your templates. What is an override? How to avoid overrides. Use the Save As and Save command. Setup backup and save preferences. Use View and Zoom menu commands. 101 ways to navigate through a document. Importing formats from other templates. Setting up a side-head area. Adding Page Numbers, Running Headers and Footers. Applying the First Master Page. Overview of text Symbols in Frame. Use Smart Quotes and Smart Spaces. Use the Revert to Saved feature. Overview of paragraph tags in your template and how to apply them. Create your Own Paragraph Styles. Overview of the Basic, Default Fonts. Pagination, and Numbering Properties in the Paragraph Designer. Creating auto-numbered paragraphs including bullets, Notes, 1,2,3, A, B, C.
Using a Character Tag to Format Your Paragraph. Overview of Character formats in your templates and how and when to use them. Compare untagged font properties to template specific character formats. Create your own character formats. Learn fun short cuts to format your document using Find/Change. Find and Correct Spelling Errors (unique features in Frame). Add words to Document and Personal dictionaries. Explore the Spelling Checker options. Learn how to use the tools in the graphic toolbox that are unique to FrameMaker. Creating Labels and Text Frames (what is the difference, cautions)! Create anchored frames and position in the text column. Place graphics in anchored frames. Align the anchored frame and its contents. Resize, copy, paste, and delete anchored frames. Use Cropped and Floating features. Control space above with the FM_AN paragraph tags. Position anchored frames outside the text column. Difference between “Import by Reference” and “Copy into Document”. Importing and scaling vector and bitmap graphics (words of caution!). How to link to PowerPoint Slides. See how changing a PowerPoint Slide updates in the Frame file automatically. Add and delete text in a table. Select and deselect cells, rows, and columns. Set page breaks in a table. Change row height and column size. Add graphics to a table. Apply custom ruling and shading. Convert text to a table. Add the variables “Sheet 1 of 2” and “Continued” to a table. Add footnotes to a table. Insert, move and delete footnotes. How to change the formatting of your footnotes. Identify items on a master page. How to add watermarks such as “Draft or Prerelease”. Learn how to globally update master pages throughout the book. Learn how to apply a specific master page - (i.e. First and Landscape). Adding Variables including Running Headers and Footers. How to map a paragraph tag to a Master Page using Reference Pages. What are variables and where are they used in your template. How to use the Reference Pages. Edit items on Reference Pages. Create your own Reference Pages for graphics or template instructions. How to turn on and off conditional text for Student and Instructor versions. How to print Student and Instructor versions of a course. Setup to “show all” for spell checking. Create your own conditional text formats. How to use conditional text for revision or draft notes. Use Boolean expressions for single source formatting. Insert, edit and update a cross-reference. Add or delete files from the book. Globally find/change and spell check throughout a book. Globally change a variable in a book. Update master pages throughout the book. Rename generated files in the book, then rename the book. Troubleshoot font errors by building a LOR file to show all fonts in the book. Create a list of all referenced graphics in a book. How to delete blank pages and why they appear. Generate a Table of Contents for a book. Use the TOC Reference Page to format the Table of Contents. Inserting markers for an Index. Learn various options for formatting Index entries. Build and update the Index in a book. Setup a PDF of the book - learn preferences for web and print. Setting up bookmarks for the PDF in FrameMaker. How to save your book as a PDF with active TOC, LOF, LOT and Cross-Reference links. Setting up resolution in the PDF for Print or for Web. Sending out a PDF for review to a group and collect edits from reviewers. Import from Word to Frame. Rename all files in the book then rename the book. Import files into the book. Successfully create a PDF of the book including troubleshooting book errors. If you have hit the wall with Word, you may want to take a look at FrameMaker 9! 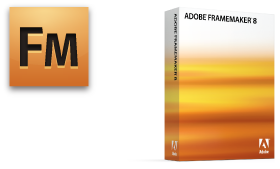 Adobe FrameMaker 9 software is a powerful authoring and publishing solution for technical communicators and an essential upgrade for existing FrameMaker users who want to author and publish technical documentation in multiple languages. an instructor myself, I understand the complexities of classroom interaction and delivering material that is brand new to some. She did a great job at incorporating aspects from all of the learners into the curriculum and is obviously an instructor who knows how to deliver material to a wide variety of learners.